This is an update on my swivel feeds experiment, in which I ask bloggers I read to help me rebuild my reading list. I have had a great response so far, and my new reading list is coming together nicely, with a diverse and interesting mix of bloggers. Here are the swivel feeds recommendations so far from the second group. Note that, when possible, I designate blogs by the name of the blogger, because I like to know who I’m talking to. These blogs join the following prior recommendations and participants in the second edition of my new reading list. I never got any suggestions from the following Group 1 members: Amy Gahran, Ben Metcalfe or Ben Werdmuller. No worries, as participation by them (like the reading of their blogs by me) is purely voluntary. Amy gets a pass because she hasn’t posted lately and may be off the grid. From Group 2, I haven’t heard from Bill Liversidge, Corey Clayton, Craig Newmark (who says via email he will try to send his recommendations next week) or Dave Rogers, but there’s still time. My general policy is to assume non-participation after 2 weeks. Dave Taylor: Dave has the best tech answer blog I have ever seen. It’s like a mini-tech Wikipedia, only everything is accurate and unbiased. Dave Wallace: One of my core blogging buddies, and recently a podcasting buddy. He’s going to be mad at me, since I already subscribed to Mike’s blog. Dave Winer: We don’t always agree on everything, but I respect his opinions and have read his blog for years. Dave, I would genuinely like your input and hope you’ll participate. David Airey: David is a graphic design guy, who writes about a lot of interesting topics. I borrowed his excellent idea of thanking Commenters in subsequent posts. Doc Searls: Everybody knows Doc Searls. As I said on the podcast the other night, Doc is a great guy and one of the so called A-Listers who remains a regular guy. Plus he likes beach music. Dwight Silverman: The tech guru for the Houston Chronicle. Another Houston blogger, and one of my long-time reads. Earl Moore: Another of my core blogging pals. He has best looking blog template I’ve ever seen. He’s going to claim it’s because he’s a Mac guy. Ed Bott: Ed is a well known tech journalist, whose blog I have read for years. A must read for all tech-interested folks. That’s the third group of bloggers I’m asking to help rebuild my reading list. If you’re willing, please recommend 5 of your favorite blogs to add to the list. Use the comments, your blog or email, whichever you prefer. This is an update on my swivel feeds experiment, in which I ask bloggers I read to help me rebuild my reading list. Here are the swivel feeds recommendations so far from the first group. Note that, when possible, I designate blogs by the name of the blogger, because I like to know who I’m talking to. Participants Blonde 2.0, Mike Miller, Amyloo, Assaf Arkin and Improbulus round out the first edition of my new reading list. So far, we are off to a good start. I have subscribed to all of the recommended blogs, and all of them are new to me. No suggestions yet from A Consuming Experience, Amy Gahran, Amyloo, Assaf Arkin, Ben Metcalfe or Ben Werdmuller, but there’s plenty of time to get them in. Bill Liversidge: Bill is a writer, like several of the swivel feeds recommendations above. I have been reading his blog for a long time, though he does not post as much as he used to. I hope he sees this. Brad Kellett: One of my core blogging pals. He’s one of my mobile tech gurus, though he writes well about a lot of other topics too. Chip Camden: Another of my core blogging buddies. He’s a software developer who, like me, blogs about all sorts of things. One of my long-time reads. Christopher Carfi: Chris is an entrepreneur, and the co-founder of Cerado. I’ve been reading his blog since I found out what blogs were. 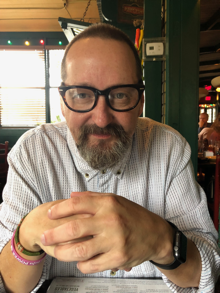 Claus Valca: Another Houston blogger, who writes detailed and very informative posts about software, among other topics. Corey Clayton: A relatively new read who I met via Twitter. He’s a tech writer and a podcaster. Craig Newmark: The founder of Craigslist needs no introduction. The first time he commented here, I actually called my wife from work and told her. That’s the only thing about this blog she actually thinks is cool, as opposed to, well, nerdy. I enjoy Craig’s political and social activism posts. Dave Rogers: Dave is a retired navy commander from Florida, whose blog I have read for a year or two. He writes well about all sorts of stuff. That’s the second group of bloggers I’m asking to help rebuild my reading list. If you’re willing, please give me 5 recommendations to add to the list. Use the comments, your blog or email, whichever you prefer. It’s no secret that I’ve been a little bored with some of my feeds lately. So it’s time to launch a grand experiment that will provide lots of good, new blogs to read. I’m going to dump a lot of my feeds and ask bloggers I enjoy reading to help rebuild my reading list. And I’m going to compile the list and share it with everyone. When I logged on today, I had 147 feeds in my feed reader. Some of them are news sites and blogs that I view as the functional equivalent of news sites. They will remain in my feeds. This group consists of Blogspotting, C|Net Alpha, C|Net News, Digital Markets, Download Squad, DPR, eHomeUpgrade, Engadget, Fark, Farmgate, Gizmodo, HD Beat, InsideMicrosoft, Lifehacker, Mashable, Obscure, Photography School, ProBlogger, PVRblog, Steve Gillmor, TechCrunch, Techdirt, Techmeme, TV Squad, Valleywag and ZDNet Blogs. Next, there are quite a few blogs that I am going to drop, because they have fallen into near abandonment or otherwise don’t interest me for one reason or another. No need to list those. Then there are the rest of my feeds. This group consists of the bloggers who interest me the most. I have a lot of interests, so these feeds cover a lot of ground. And I want these folks to help me reseed my reading list with blogs they like and/or think I’d like. I’ll update both the list and my feeds as we go, and when we’re done, I’ll post the entire list and an OPML file for anyone who wants it. So, once or twice a week, I’ll list several of these blogs, describe briefly why I enjoy them and ask each of the writers to add 5 blogs to the list. So let’s get started with the first 8 bloggers. A Consuming Experience: I learned a lot of the technical stuff I do with my blog template from Improbulus. Her blog is a living resource for blogging and technical tips and how-tos. Amy Gahran: She was the first person who got me thinking about blogs as conversations, which became my core blogging philosophy. Amyloo: Amy blogs on a lot of topics that interest me. A great blend of tech, politics, music, philosophy. Assaf Arkin: He’s one of my favorite software reads, and the Tom Clancy of the blogosphere. Lots of hard, but understandable, tech. Very little “me too” posts about the latest bookmarking application, etc. Mike Miller: Mike is one of my core blogging buddies, and someone I discuss stuff with almost every day. He’s already led me to lots of good reads and several people who’ll appear in this series, but I want more. Ben Metcalfe: Ben is a social media commentator and developer. Thus, I learn a lot more from him than a lot of the social media bloggers who merely regurgitate what they read on TechCrunch. Ben Werdmuller: I realize that Nuclear Sledgehammer is a group/company blog, and I mean no disrespect to the other writers, but Ben was the one I started reading first, so he gets the recommendation request. Good, thoughtful writing about the blogosphere, social networking, etc. Blonde 2.0: Ayelet came out of nowhere to quickly become one of my favorite bloggers. If she posted a little more, she’d be in the Technorati 100 within a year (Steve Rubel once said that about me, but I didn’t quite make it). So there are the first 8 bloggers I’m asking to help rebuild my reading list. If you’re willing, please give me 5 recommendations to add to the list. Use the comments, your blog or email, whichever you prefer. Also, if you are a blogger I don’t know about yet, feel free to tell me about your blog, and it may make the list too. And if you’re one of the rare non-blogging blog readers, please give me your list too. I am very interested in recommendations from non-bloggers.